CHICAGO (jGLi) – A lot of times when you see kids jumping on the street as they make their way to and from schools on school days, they are not really dancing nor are they having fun. They are actually grimacing in pain as they struggle to avoid the sun-baked concrete or asphalt road when they are walking with their bare feet. On the other hand, if there is low turnout of students in the school, it’s not because they are sick or having errands. It’s because they are too hungry to go to school because they have nothing to eat. Zayda O. Baron, former president of Bikol U.S.A. of Chicago and former president of Bikol National Association of America (BNAA), appealed to the officers and members of Bikol U.S.A. of the Midwest during a meeting last Oct. 7 at 3839 N. Kedzie in Chicago, Illinois to send in contributions so that she can buy sleepers for students, who are walking barefoot. Ms. Baron was referring to very poor students in the far-flung areas in Bikol region, whose parents cannot even afford to buy sandals for their school-age children. On the other hand, she also noticed that there is a preponderance of absentee students because many students have no food to eat during breakfast nor do they have any food to wrap up in their brown bags for their lunch. However, it was not discussed if parents are being educated to stop having children if they don’t have jobs and if they have no money to raise a family. In response to the appeal, Evelyn R. Tolledo, president of Bikol U.S.A. of the Midwest, has encouraged members and friends of the club to donate money during the club’s Masquerade Ball starting at 5 p.m. on Oct. 29, 2011 at 3839 North Kedzie in Chicago. During her brief remarks, Ms. Baron said the $1,000 check donated by the club to victims of Typhoon “Juaning” last July 30 was given to many families, who each received one kilo of rice and six dried fishes. These were mostly for families in Bato, Bula, Buhi and Nabua, Camarines Sur. She brought albums of photos that documented the distributions. She was assisted in the distributions by her husband, Senen, her brother, the late Engr. Joe Ordonez, former President of Bikol U.S.A. and Ordonez’s wife, Virginia or Jenny and other volunteers. She also bought a big container of bread and ice cream for very poor school children. Parents of these children even begged to also have ice cream. Ms. Baron also reported that the BNAA, of which the Bikol U.S.A. of the Midwest is a member, has so far 38 scholars in Bikol. Because of the unceasing presence of typhoons in the region, there were discussions on the fruit-bearing plants that should be encouraged to grow in Bikol. The most popular suggestion is the lemon because of its very short stature at maturity – it bears fruit even if it is very short and will not be swaying with the punishing wind. Honorable mention is the dwarf coconut that is also indigenous in the region, like the lemon, and can avoid the whipping of the typhoons. During the meeting, there was also a treasurer’s report of the annual golf tournament dedicated to the late Bikol U.S.A. President Joe Ordonez. The tournament was held last Sept. 25 at Big Oaks Golf Club & Country Club in Pleasant Prairie, Wisconsin. The club is also slated to hold its Christmas Party on Dec. 9, when new set of officers will be elected. 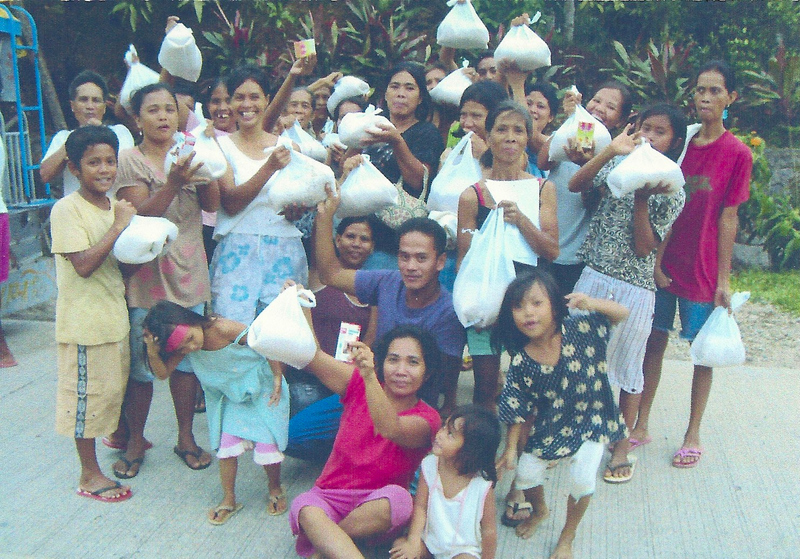 The Bikol U.S.A. of the Midwest brought cheers to victims of Typhoon “Juaning” last July after they received one kilo of rice and six dried fish in Bikol region. CHICAGO (jGLi) – Two weeks ago, 12 Philippine senators, including my friend former President Joseph Estrada, got together to celebrate the 20th anniversary of their 12-11 vote, rejecting the U.S. Military Bases in the Philippines. While I applaud them for their nationalism, I feel that they were like the Monkey in the fable Jose Rizal wrote about the Monkey and the Turtle. As you know, in the fable, the Monkey gave the Turtle the choice of the manner of death he would deal on the Turtle — the Turtle would either be pounded into pieces in a mortar (lusong) or he would be tossed to the river. Of course, the Turtle tricked the stupid Monkey by choosing the mortar because the Turtle did not want to drown in the river. When the 12 senators padlocked the U.S. bases, they did not tack a rider on the rejection – the termination of the agreement would be contingent on the U.S. clean-up of the bases of their toxic wastes. It was like telling the renter of your apartment to take with him all the unsightly furniture before the renter turns in the key to the apartment owner. Because our jolly senators forgot or overlooked this expensive environmental hazardous clean-up, it will now be the responsibility of the present Philippine Congress to appropriate $102-Billion to survivors of deceased victims of toxic contamination caused by hazardous substances stored and used in Clark and Subic military bases. A similar demand was also served on the Philippine government in the amount of 52-billion pesos (US$1.2-billion) for neglect and refusal to deal with incidents of deaths and illness of the victims, who worked and lived in the two U.S. military bases in a class suit pending before the Regional Trial Court in Pampanga. The United States cannot be compelled to pay up because it is not a signatory to the 1989 Basel Convention that penalizes countries that are responsible for risk of damage to human health and environment caused by hazardous wastes while the Philippines is a signatory. So, the “Magnificent 12” actually let the U.S. go like the Monkey did to the wily Turtle. If the Philippine Congress wants to go on a damage control mode, it better adopt a U.S. law called Emergency Planning and Community Right to Know Act of 1986 (EPCRA), requiring companies to provide information about their potentially toxic chemicals, if it has not yet done so. EPCRA was the result of the U.S. Congressional hearings triggered by the leak of a cloud of lethal methyl isocyanate in a 1984 Union Carbide pesticide plant in Bhopal, India that caused the death of 2,000 people while they were sleeping and another 8,000, who died later. The Union Carbide paid $470-M in damages. Among the features of EPCRA is a requirement for the Department of Transportation (DOT) to establish hazardous materials placard system to help emergency responders to know what they are dealing with. Rail cars and trucks carrying toxic or dangerous materials must display a diamond-shaped sign having on it a material identification number, which can be looked up to determine what hazardous materials are on board, and a hazardous class number and symbol that tells whether the contents are flammable, explosive, corrosive, etc. Color codes also convey instant information: blue (health), red (flammability), yellow (reactivity) and white (special notice). The placard system is as follows: Hazard class 1, explosives; Hazard class 2, gases (nonflammable, flammable, toxic gas, oxygen, inhalation hazard); Hazard class 3, Flammable liquids; Hazard class 4, Flammable solids (spontaneous combustible, dangerous when wet); Hazard class 5, oxidizer and organic peroxide; Hazard class 6, toxic/poisonous and infectious substances; Hazard class 7, radioactive; Hazard 8, corrosive; and Hazard class 9, miscellaneous dangerous goods. The absence of these placards from a chemical tanker that split into three in Barangay Pange, Matnog, Sorsogon in the Philippines at about 2 p.m. on Sept. 24, 2011 is giving authorities a hard time on how to deal with the accident. It took Pange Barangay Chairman Fernando Genavia and Barangay Kagawad Ruel Genavia two weeks on Oct. 6 to report to Dr. Rossana Galeria, municipal health officer of Matnog and Matnog Mayor Emilio G. Ubaldo after telling the Matnog Sanitary Inspector that many cases of diarrhea and epigastric pain had occurred following the tanker explosion. According to accounts, the tanker broke down along the highway of Barangay Pange and split three ways and its unknown liquid contents spilling into nearby trees and ground. Without knowing what the content was, the residents collected the liquid as fuel for cooking and lamps. Typhoon “Pedring” washed the chemicals on Sept. 25 and 26 to the inner part of the forest and into the river. The trees and grass on the path of the liquid had died and turned brown, including the algae in the riverbed. Fishes died. Residents had complained of caustic smell from the river and some had diarrhea. Although decontamination is being conducted among residents, the residents do not want to cooperate. With a population of 520, the barangay residents are mostly indigents, depending on farming for their livelihood. Because hundreds of vehicles, including chemical tankers, are passing by the barangay everyday on the way to and from Luzon, Visayas and Mindanao, more hazardous materials are likely to be spilled in the area. If the Philippines has EPCRA in place and there is hazardous materials placard system, a rapid response team in the municipality created by the law would have been notified by the residents to report the accident, mentioning the number of the placard and extent of the spill as there is threshold of spills to report (say 1,000 pounds of Sulfuric Acid are spilled) as test results of the contents would be taking weeks to find out. It is just like calling police during emergency. Early in life I have learned to accept that some things shall just remain as dreams, as persistent longings that I’ll be carrying around. Since the start of this search for my Asuncion roots, my longings to know more about my fathers (and mothers) and to find any related information have intensified. 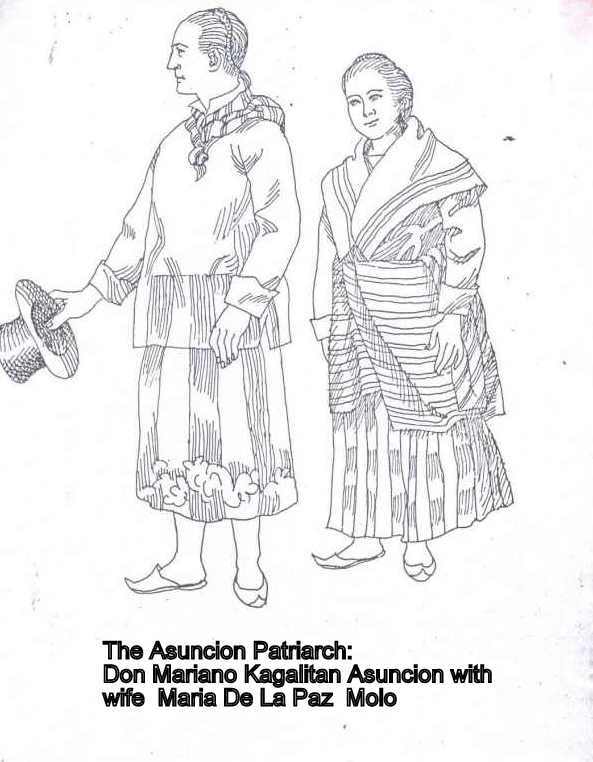 And how my great grandfathers may have looked like have greatly preoccupied my imagination but came to terms with the fact that this was all to it and nothing more since even the known self-portrait of Justiniano Asuncion was lost. I thought that was all, lost forever. I thought, but I did not know. I did not know that a certain family by the name of Quintos – Guirzon has been keeping my dream in their photo collection and that one day I’ll be receiving a copy of it from my cousin Ding Asuncion. Unbelievable but this time it was true. I admit that in my age, even a lightning strike wouldn’t make my eyes bluesy and wet. But that moment when the image unfolds itself by the click of the mouse, I lost almost a river of tears from this great joy and this feeling of reunion with my ancestral roots. I was speechless when I saw the faces of Justiniano, Zacarias, Benita and Jacobo! Zacarias is my great-grandfather. What I remember to have seen in my childhood was just a piece of Zacarias’ gravestone in our compound in Canipaan which unluckily I didn’t find anymore when I came home a few years ago. When times were getting rough for the Asuncions in Binondo, Zacarias left for Bicol in search for new possibilities. A different time, indeed, for who would think today of going to a distant town of Bulan in search for better opportunities? Whatever his true motivation was, Zacarias’ travel established the Asuncions’ connection with this town. This photo has closed those gaps in my mind and fulfilled those deepest longings of seeing the faces of my fathers. It was my younger relative Christopher Yatco who first drew my attention to the existence of a new book about Damian Domingo with the photo of Justiniano and his children. My excitement soared even beyond the moon. However, being out-of-town, I couldn’t get this book. Luckily though Ding Asuncion, grandson of Kenerino Asuncion and Lola Leny, sent me this copy of the photo together with some excerpts of this book. Here, you see the master painter himself, Justiniano Asuncion, the creator of those art pieces we’ve been talking about, those portraits of the Asuncion women, those watercolor paintings at the New York Public Library, etc. He was the first Filipino painter who allowed himself to be ” drawn with light”. i.e., to be photographed. Luckily he posed before a camera, a kind of high-tech gadget in the early 19th century which, to my view, seemed to have been invented to ultimately challenge Justiniano’s perfect eyes for capturing details of the subject when all other painters had given up the fight. In 1816 Johann Heinrich Schultz discovered that a mixture of silver and chalk darkens when exposed to light. But for our case, a star was born that brightened the world of 19th Century Filipino art when the baby Justiniano was exposed to light also in 1816. Justiniano possessed a pair of highly photographic eyes that perfectly fitted to the miniaturist, realism painting style of his time. To this perceptual acuity, Prof. Santiago wrote: “In the state of boredom, he often used his skills to amuse and confuse his guests and admirers alike. He is remembered to have painted on the downstairs wall of his newly built house, right under the window balustrade, a life-size infant falling in midair. The picture never failed to startle or evoke shrieks from passersby who at first glance thought the child was real. Once he also painted on the top of the chest, a scattering of very realistic coins, causing embarrassment to guests who stopped to pick them up”. It was ca. 1894 when Schultz’s mixture went off into action which today – 117 years later – would have a profound effect on many of us, up to this very moment as I try to write while poring over this photo which seems to me a gift fallen from heaven. I’m highly indebted to the prime mover of this event, Hilarion Asuncion, the man behind the camera, my great grand-uncle and to all those good things and chain of events that worked together – in obedience to the inner logic of Asuncion’s fate – that ultimately preserved this image over a century, over these rough and repressive times. Like his father before him who served as cabeza de barangay of Sta. 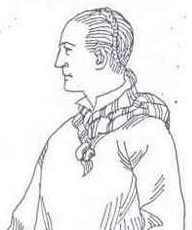 Cruz in 1805, Justiniano became cabeza de barangay in this community of mestizos in February 25, 1853. By this time Justiniano was already established as a master painter. Thirty years after, his son Zacarias, in search for more better business opportunities, set out for Bulan, Sorsogon in 1886. Hence, this year was a milestone in the history of Asuncions of Bulan. There, twelve years later, at the turn of the century – and of the nation’s colonial history – Zacarias became Jefe del Pueblo (old name for Municipal Mayor) of Bulan from 1898 – 1900. If artistic genius was in the Family of Justiniano Asuncion and so was community leadership, I think. It was due to Zacarias’ successful Bulan’s adventure that brought Justiniano Asuncion to Bulan, already old and grey, a man behind the sparkle of past success, within the silhouette of death. Bulan became his refuge, the sanctuary of his tired body and soul and the gate to his eternal rest. If the biographer Manuel Artigas called him “modelo de honradez, an exemplar of tacto y prudencia”, then it was an honor for Bulan to have such qualities be buried in its grounds. For these qualities had to come out again forty-five years later after his death in the person of Adonis Asuncion, my grandfather, who became Mayor of Bulan in 1941. My grandfather Adonis Asuncion had led Bulan not in times of political Padrenos, vote buying, plundering and pork barrel but in times of foreign aggression where one must have to defend the basic rights of Bulaneños. So my fathers were community leaders when three superior nations ruled our land: Mariano and Justiniano in Sta. Cruz during the Spanish time, Zacarias in Bulan just at the beginning of the American rule and Adonis, also in Bulan, during the Japanese occupation. All three men had their share of what I call the roughness of times but all came out hardened in their character, in their convictions. From their stories I learned the lesson that political leadership is about self-respect in the first place. Methinks that the political, civil and military leaders of today who are now facing corruption and plunder charges had failed to respect themselves and their very own families in the first place. Hence, how could they ever respect the town people they don’t personally know? 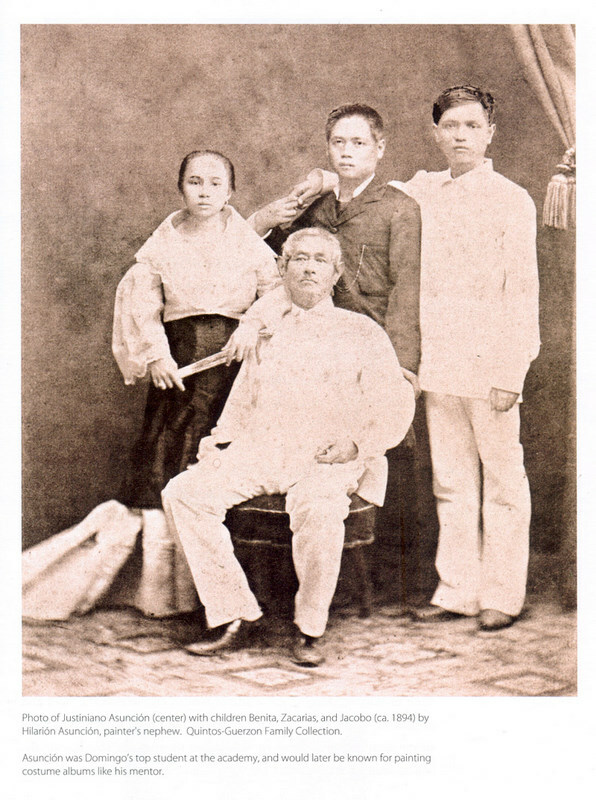 The three foreign aggressors may have ruined the Filipinos by introducing to us the culture of corruption, aggression and militarism but it seems that the families of Mariano Kagalitan- Asuncion were among those Filipino families blessed with the immunity from these foreign viruses that they were able to keep their name clean and their being “modelo de honradez, tacto y prudencia” while serving the people – in those times of conspiracies, opportunism and collaboration with the aggressors (survival of the “fittest”). Their thoughts about the future? That future is here with me in this very moment as I search for my past and found it here in my room where I have spent hours of thinking about my fathers, bending my six strings to soaring bluesy heights as I figure out their faces, how they had lived, to what degree had they suffered from the roughness of times, from the yoke of colonialism and how much they had longed for freedom and dreamt for a better future. I was born 59 years, my father, Andres, Sr., 19 years after Justiniano’s death. Indeed, it seems not too long ago but if I add to it my own life where memories fade out already after a short moment of recollection then everything about my fathers becomes an abyssal zone except for some floating traces they had left which serve only to tickle my inquisitive mind and my longing to know more, thus eventually blowing my mind away every time I was trapped in some of these black holes of imagination. Seeing the faces of my fathers and my roots this way has finally given me that solid ground, sense of continuity and peace of mind, a privilege that I know not everybody has in this world. So I’m thankful to my relatives for all their help in our search for our lineage as I hope for contributions in any form to come more. The demise of our father last November 3, 2005 was certainly a big blow to all of us. Now three years after, we all seem to have accepted the reality of our beloved father no longer physically with us. There are moments though when I am caught unaware and seem not to realize this fact. Then I feel instantly transported back to these moments of grief last November. It is surely not easy to lose a father and I think I will never get over it. There are absolute privileges that you get only once in your life time and that if you lose them you can not replace them. A father is one of these privileges. The pain that you experience tells you how much you love somebody who has been taken away from you. There is nothing on earth can equal that pain. There are no words to describe it. You can only try to express it in some other ways except in words. And you can not describe it in real-time with words. For it is an experience beyond our language. It is a primordial event and that is why it is just purely pain that comes out of our innermost being. It’s like when a newly born cries responding to a sensed change and discomfort , and yet it’s more than that for a newly born is not weeping, – you are weeping. I don’t know how my mother and my brothers and sisters deal with such moment of despair and pain. We all experienced our father differently, we all have a different image of him that each of us has carried throughout those years. But there is one thing in common that I am sure of, and that is, that we all love him. The way that each of us remember him in his/her own way that sums up the whole image of our father. I am not referring only to the images arising from incidental experience of him as other people had of him but this exclusive experience of inner connectedness to him as his children. This blood connection that goes all the way to the spiritual sphere of our existence. I have been deprived of my father physically, for instance, for many years. But not a day had passed that I did not think of him. If not in dreams then just in my waking hours are these flashings of his images in my mind, and his voice was and is just there; vivid scenes of my childhood days with him in Ilawod and Canipaan, in Manila and here in Zürich when he came with my mother. In all those years of being away from him there was always this desire in me to have a coffee with him and talk with him about the world, yes, just about anything else. With my father I had always enjoyed sharing thoughts or just sitting together in silence. I felt this freedom, this feeling of fullness as a human being whenever I was with him. A man of peace that he was and very dignified in his ways, his presence was always a source of joy to those who love him and perhaps an irritation to those who believe in approaching things and issues the more aggressive way.Yes, he remained true to himself to the very last moment of his existence. That’s the measure of being a man. His quiet countenance radiated an inner strength that came from deep insights and wisdom about life and situations. His courage was never an issue of alcohol content in the blood (he never drunk) , but in his refined ways of dealing with things due to his education and his unending patience, sharp intellect, broad knowledge and humility. My father experienced the cruelty of the Japanese invasion in 1945. He was then a young man of 25. He related his stories for the last time last August 2006 to me and my sons Cyril and Samuel, and I feel really privileged to have experienced this. This answered the question I’ve been carrying at the back of my mind for many years, a question that I always failed to ask him whenever I was with him: Why did you not take up your arms and fight side by side with your brother Agusto Asuncion ? (who at that time was the head of the Lapuz Guerilla movement in Bulan). His recounting of his war story last August finally revealed the answer to me. He said, his brother Agusto advised him not to shoot but rather to take charge of the logistics. My father had a very sharp memory and he could remember the details he experienced at that time, names of people and places, to the astonishment of my boys. I noticed his fair judgements of people and events involved. So Papa knew his own role in this war right at the outset. People like me would have instantly joined the front line at that time. But in the long run, justice and history is at the side of the wise and peace-loving people. One should know that my father came from a different tradition, from a tradition of love and compassion to all God’s creation. He came out right from a theological seminary in Paco, Manila when the war broke out. The Japanese bombed Manila and that seminary where he was one of the three candidates for ordination. 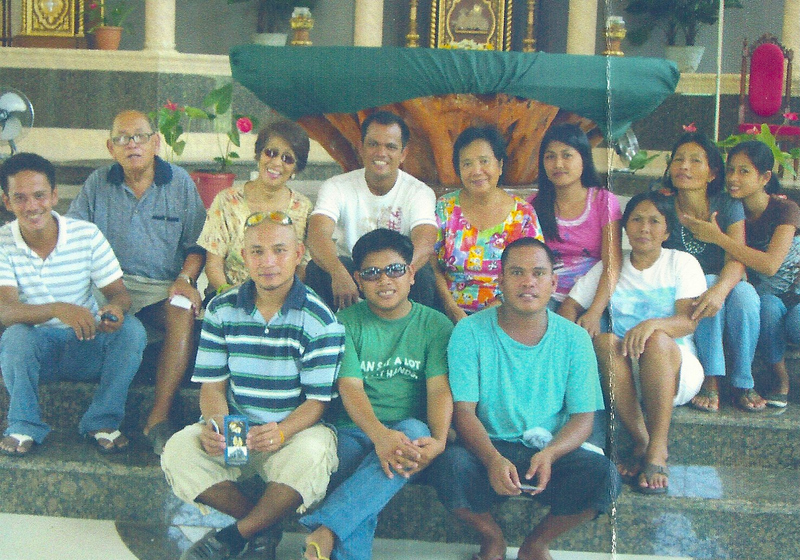 They had to separate ways and Pa went home to Bulan to his family where his father Adonis Asuncion was the town mayor. He walked from Manila to Bulan, Sorsogon for around three weeks using the railways as his guide and survived the hazards in the streets, especially that critical moment when from under the tree trunk suddenly came out a handful of Japanese soldiers, stopped him, asked questions and inspected his backpack. “I remained quiet, and the officer caught an eye at the shaving blade (Labaha) I had and took it in his hands…(now the officer could have just swung this blade to his neck, if he wanted to.) He seemed to be interested in it so I just nodded my head and they let me go!” Wow, Papa would have flown like a bird if he could at this moment. Kidding aside, I thank this officer so much for letting my father go and, in retrospect, I respect this Japanese officer for his intuition. He must have felt that Pa was not an enemy. And, indeed, Pa did not kill a single Japanese soldier! Now the thing is, if you are proud that your father killed hundreds of Japanese soldiers at that time, I support that for it was wartime, and your father was destined to kill. That my father came out alive without harming anybody’s life, I’m certainly proud of this; he was simply not destined to kill. He was true to his convictions and fate was true to him whole life long. That unknown gentle Japanese officer was right. 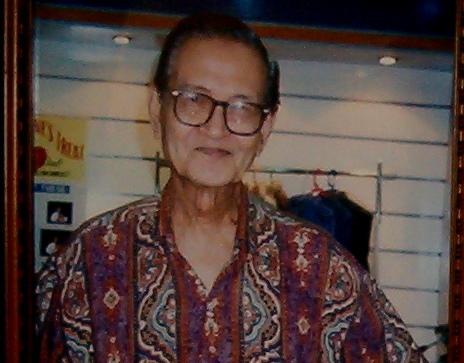 I can imagine Pa in his prime: neatly dressed with hair soaked in pomade, misplacing probably his eyeglasses but never his smile. Beside him my mother, excited, and around them the eight of us.The flash went off and here is the picture on my table in front of me, taken about 40 years ago. I treasure this only family picture where we are complete. Those were memories to keep and live by, when my world was young and innocent in the true sense of the word. The family was my ground and I felt safe and fear was foreign to me. I was just happy being embedded in the family and that was everything that mattered most, not the hardships or the lack of other things. A boy who is happy has everything he needs to master the challenges and hardships that are normal concomitants to life. Deprived of this, you can not expect a better course of life. So, I thank you Pa and Ma for laying down a solid foundation which was a mixture of fine ingredients, – of love, trust and compassion, coupled with patience and loyalty. This was how I perceived my parents and understand their role even up to now. How the rest of us had experienced my parents in our growing years, only they can tell. Throughout those years, there was one trait of my father that impressed me most, and that was his unassuming character. I’d never experienced him boasting around about anything. In fact there was always this permanent aura of understatement accompanying him throughout his life. Simple in his ways and in his daily needs, he would always put you first before him, giving you space and making you feel comfortable in the modest means available. He did not desire for more. For an opportunistic in character, a chance to attempt a coup’d’etat, for a sensitive in spirit a feeling of meeting with a teacher. Unassuming and reticent that he was, the most profound insights and comments that I heard in life came from him. Being modest in his ways and putting others first, he showed them how to respect themselves. No wonder why he got respected in return by people around him. This was my first lesson about authority, not a coerced one nor based on a false assumption of something but a natural process of growth from within that manifests itself as a result quite naturally in your essence . So harmless that he was before you, you got no choice but to respect him and show the best in you. This was exactly this respect that we learned from him that kept us together in our long journey as a family. With my father, I learned to cross a hanging bridge for the first time in my life in the barrio of Magsaysay where he used to teach. For Papa that was a daily routine, for me an adventure and a source of anxiety. I nearly got sick when I looked down for it was deep and the river beneath was wild and the bridge swinging to its sides, step was not stable and there were holes on the floor. I was then 9 or 10. Pa did not say anything at that moment that I could remember. He just looked at me, stepped on it and I followed him. It was an incredible act of balancing and I became dizzy. I was alarmed, gathered myself together to make it to the other end. He was already at the other end and was watching me, smiling. Reaching the end a feeling of relief and I felt proud as I looked back at the now empty hanging bridge that was still undulating like a long snake. My tension was transformed instantly to fascination when I saw the wonderful garden all around the school buildings and the school children also about my age. Flowers of all kinds. I especially remember the red roses. Barrio Magsaysay, a world so beautiful abounding with floras and faunas and friendly people. A piece of paradise, just nature as she is. Looking back now, I just realized that Papa spent almost his entire teaching career in places like Magsaysay. I knew that he was also assigned in Sta. Remedios and in other remote places I don’t even know the names anymore. Those years had cultivated in my father the love for simple people, for farmers and nature. I went back to Magsaysay a few times with Papa, most of the times carrying ballot boxes hanged on my shoulders. During election day the teachers were busy and so was Pa. I was always with him to carry those boxes. Crossing the hanging bridge became an enjoyable experience then. I began to love it and in fact now it keeps me wondering if it still exists. That was many years ago but the memories remain. That hanging bridge connected me to my father ever more. I wish to visit that bridge someday for on that bridge were those nice moments left hanging in time. A schoolbag with guavas- and sometimes a bird. As a young child it was always a highlight in my life when the day was about to close for then my father would arrive from school. I used to wait for him in the street in front of our house while I played with other children. Then I would run to him the moment I recognized his silhouette at the horizon moving in front of the setting sun that was about to disappear behind the China sea. I would literally dive into his bag to find out what was in there. I remember well the smell of guava fruits of his bag. Indeed, he always brought home fruits of all kinds everyday but it was always the smell of a guava that dominated inside his bag, even without guavas in there. And I loved that smell always. But it was not the guava fruit that I was excited to find, rather it was a bird or two! Pa used to bring home birds he received along the way from his pupils in Magsaysay and he would just put the cage in his schoolbag together with his pens and notebooks. At that time I came to know the most lovely local birds in Bulan through Papa. One time I discovered in that bag a Kingfisher and it was the joy of my childhood to have such a noble bird as a house pet for sometime. I thank my father now for all those nice little surprises every afternoon. Everyday after dinner the same routine: Help wash the dishes and restore order on the table for then comes the next dinner,- the dinner for the mind by candlelight. I would empty my schoolbag on the table and I would begin to work on my homework while Pa on his lesson plan. This went on during my entire elementary years. I also remember my sister Malou being on this scene. I did my homework religiously at that time. But one evening I was so tired that I think I just left my notebooks open on the table, leaving my homework haf-done only as I scrambled for bed. I was then in grade three. The next morning at school my teacher Miss Chavenia ordered us to open the assignments for checking. So, as usual, she went from one desk to another scanning with her sharp eyes every pupil’s work and with a look which tells you “with me you can’t bargain”, or “you better run for your life”. I was nervous then for I was not sure if my work was finished or not, for I never bothered at all to check my things before going to school. So you can imagine how I’d wished to disappear, to be invisible before she could come to my desk. As I opened my notebook, my eyes nearly fell out on the floor out of disbelief that my homework was done! I instantly remembered Pa and marveled if he finished my homework when I deserted the war zone and went already half-sleeping to bed. Until now this remains a mystery to me and, as usual, I never came to the point of asking Pa about it. In any case I was spared from standing still for an hour in a schoolroom’s corner, a punishment for lazy pupils in my time. Thank you Pa for saving my life – and for all those dinners for the mind by candlelight! A song Fields Of Gold.